Ten Rochester Institute of Technology students got to begin their summer vacation in Japan, immersing themselves in a new culture and learning about the world’s third largest video game market. 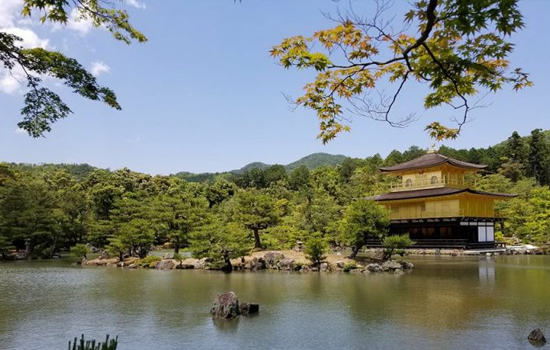 The two-week trip through the Japanese cities of Shiga, Kyoto, Osaka, Hiroshima and Tokyo was the culmination of a spring semester course that introduced students to game design and development in Japan. For the study abroad program, students learned from gaming professors at Ritsumeikan University, participated in a game jam with Japanese students and visited five game studios, including Bandai Namco—best known for creating the game Dark Souls. Stephen Jacobs, a professor in RIT’s School of Interactive Games and Media (IGM), has taught similar study abroad courses before, previously taking students to explore the German video game industry. He chose to create a study abroad to Japan, along with David Simkins, an associate professor in IGM, because Japan is so key to the video game industry. 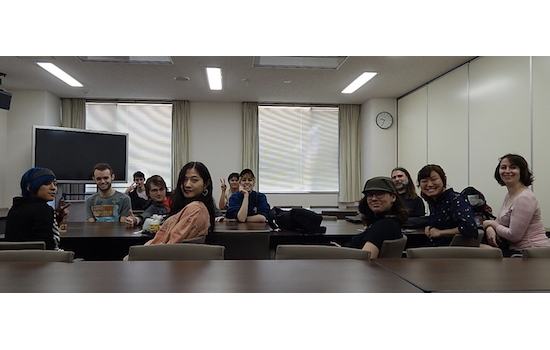 As part of this year’s trip, students logged their adventures in a class blog, titled IGM Explores the Games Industry and Academia in Japan. 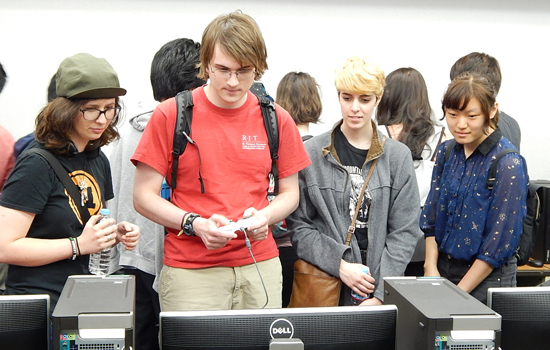 RIT students also visited Kyoto Computer Gakuin, a long-time sister school of RIT, where they saw some of the student games demoed and got to discuss the differences and similarities in their studies. Over the weekend, students from all three schools teamed up to collaborate in a 10-hour game jam, where they worked to create video games from scratch. “We organized the game jam because encouraging interaction toward a purpose around an exciting shared goal is excellent context for learning about other people, how they work and what is important to them,” Simkins said. Students also got to tour several professional game studios, including Universal Studios Japan, Q-Games, CyberConnect2, DeNA and Bandai Namco. While at DeNA—makers of the upcoming Mario Kart Tour—students even had their game jam creations reviewed and critiqued by two professional game developers. At the Universal Studios Theme Park in Osaka, students got to tour some of the attractions and learn about the design process from members of the design team. Throughout the trip, students were fond of Japan’s cuisine, from regional dishes like okonomiyaki in Hiroshima and takoyaki in Osaka to “cheap, but quality, convenience store food around every corner. The group also had dinner with members of the Japanese chapter of the International Game Developers Association (IGDA). 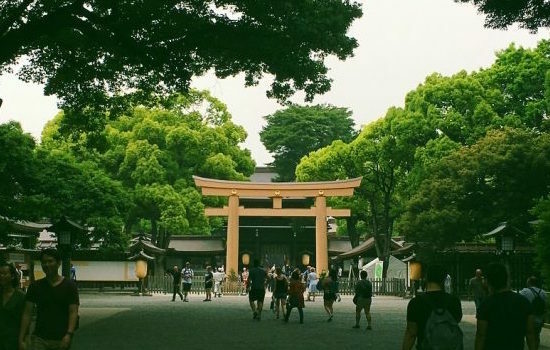 In addition to video game-related visits, the RIT group also took time to experience the history and culture of Japan, making stops at gardens, shrines, the Hiroshima Peace Memorial Park and Museum, the gardens of Tokyo Imperial Palace and the Ghibli Museum, a museum showcasing the work of the Japanese anime powerhouse Studio Ghibli. For Aiden Melendez, a game design and development master’s student, the program was an opportunity to check out the Japanese game industry for a possible career choice and put his minor in modern language Japanese to practice. In 2018, The Princeton Review ranked RIT as one of the top places in the world to study game design. The undergraduate and graduate level programs are housed in the School of Interactive Games and Media (IGM) within the B. Thomas Golisano College of Computing and Information Sciences.